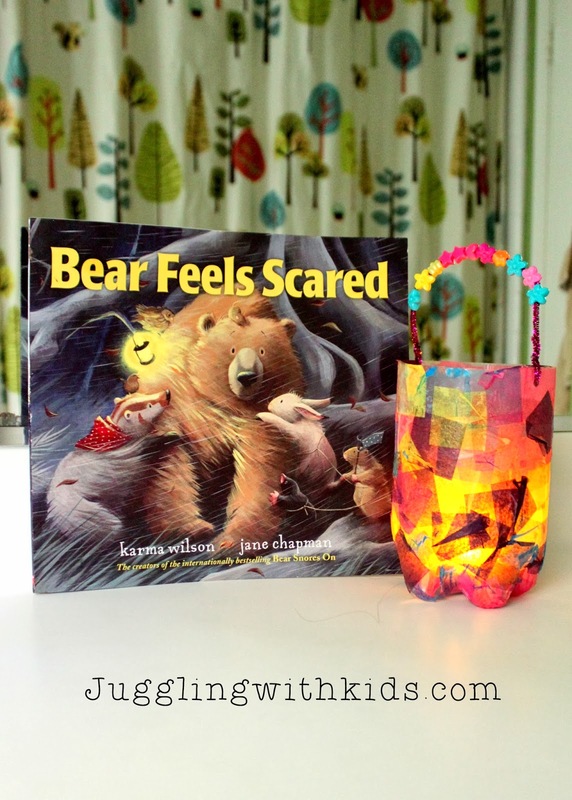 For this months Virtual Book Club for Kids we read Bear Feels Scared by Karma Wilson. It’s about a Bear who gets lost outside in the cold woods. When his friends discover that he is missing they go out searching for him because they know how scared he must be outside in the dark. Our inspiration for our craft was the lantern the animals used when they went to search for their friend. 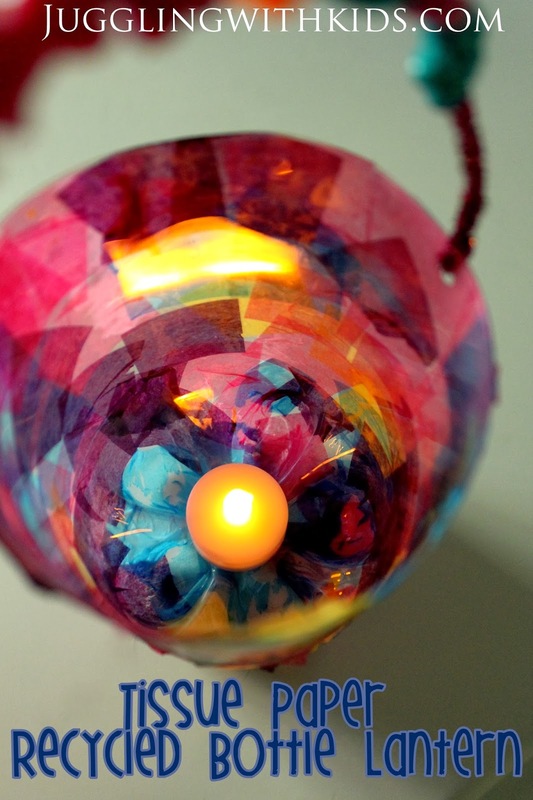 I then applied the same technique for this craft as we did for our Tissue Paper Fish Bowl Lanterns. Turn a tall cup upside down and rest your sharpie pen on top. This will help you draw a straight line around the 2-liter bottle. As you place your bottle next to the sharpie, spin the bottle around slowly to draw the line. Take some sharp scissors and cut along the line. You will also want to prep the paste. About 3 parts white school glue with 1 part warm water is perfect. It doesn’t need to be perfect. Your objective is to have paste that is a tad bit more watery.With a brush, apply your glue/water solution to the bottle. Then lay your tissue paper on the glue. We also added it to the bottom of the bottle. Go over the tissue paper with a brush dipped in more glue, and make sure that the tissue paper is saturated. Proceed around the bottle and set aside to dry. Punch two holes around the rim with a hole puncher. Take a pipe cleaner and string some beads on it. Then pull your pipe cleaner through the hole and twist the pulled end to the other end to secure it. Add a flame-less tea light to the bottom of your lantern and enjoy as a night light.